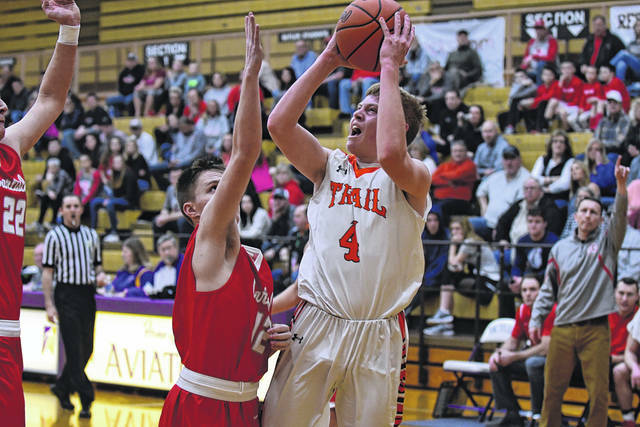 National Trail sophomore Cameron Harrison made a school-record 69 3-pointers last season as a freshman. He returns to help a veteran group wanting to improve on its 15 wins from a year ago. NEW PARIS — National Trail returns a veteran group of players from a team that went 15-9 team last year. Add in veteran coach Mike Harrison and the Blazers could be primed for a successful season. The Blazers return four starters off a team which finished 7-5 in the Cross County Conference and tied for third. Travis Hunt, a senior guard, returns for his fourth season starting at the point. He averaged 10 points per game and 3.8 assists per game to earn special mention All-CCC. Senior guard Adam Eyler, who excels on defense, was sixth man as sophomore and started last year as a junior. 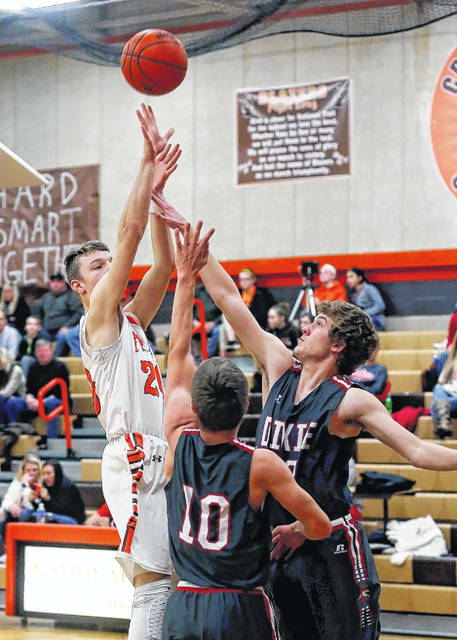 Zach Woodall (junior guard/forward), who averaged 9.8 points, 6 rebounds, and 3.2 assists, is a very versatile player that can play inside or outside and really came on toward the end of last season, according to Coach Harrison. Cameron Harrison is a sophomore guard, who averaged 15.6 points, including school record 69 3’s last year as a freshman. He earned first-team All-CCC. Other key players returning include Hunter Michael and Josh Bishop. Michael, a senior post, was the sixth man last year and is expected to play huge role for the Blazers providing inside presence offensively and defensively. Bishop, a senior guard, provided quality minutes last year off the bench taking care of the ball and playing solid defense with great energy. Newcomers this year include Evynn Short, a senior guard/forward. He saw a little varsity action last year and is a good shooter who needs to help provide physicality for us this year as well. Coach Harrison sees the CCC title up up for grabs. The Blazers varsity team is scheduled to open the season on Friday, Nov. 30 at the Twin Valley South Tip-Off Tournament. They will meet Eaton in the first game at 6 p.m. On Saturday, Trail will play either South or Dixie at 4 p.m. or 5:30 p.m. depending on results of the first round games. The junior varsity will begin its season on Saturday, Dec. 1 at 1 p.m. against Eaton. They will play again on Monday, Dec. 3 against either South or Dixie at 6 p.m. or 7:15 p.m. depending on the outcome of Saturday’s games. 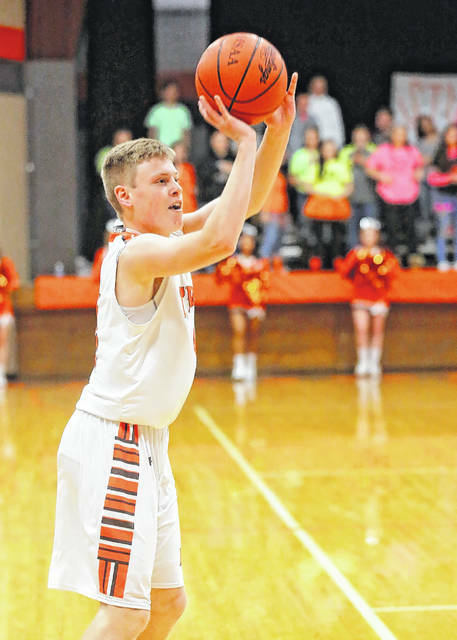 https://www.registerherald.com/wp-content/uploads/sites/41/2018/11/web1_ntbbk9.jpgNational Trail sophomore Cameron Harrison made a school-record 69 3-pointers last season as a freshman. He returns to help a veteran group wanting to improve on its 15 wins from a year ago.